Need a better way to engage your accounts but having trouble connecting your leads to accounts in Salesforce®? Check out Full Circle Matchmaker, built by Salesforce veterans to help you drive your account prospects to a close through precise lead ownership and engagement. 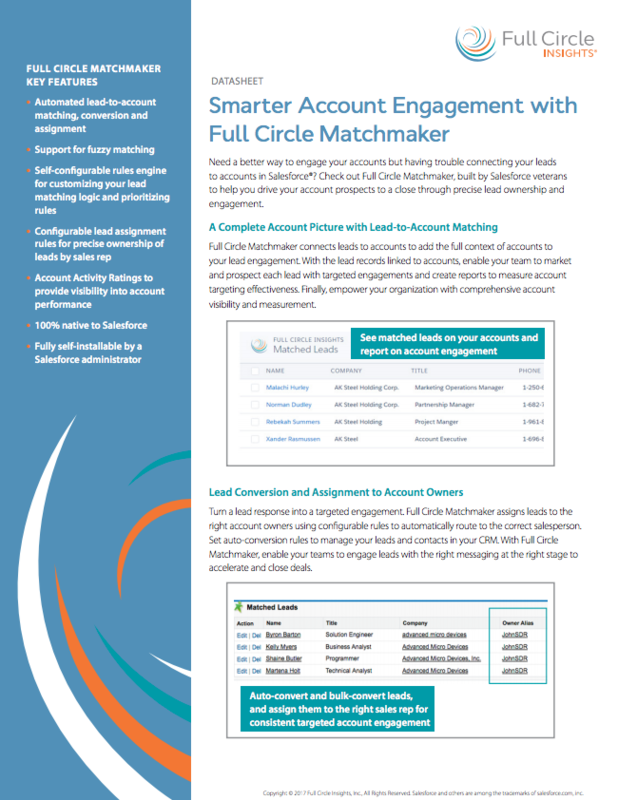 Full Circle Matchmaker connects leads to accounts to add the full context of accounts to your lead engagement. With the lead records linked to accounts, enable your team to market and prospect each lead with targeted engagements and create reports to measure account targeting effectiveness. Finally, empower your organization with comprehensive account visibility and measurement. Turn a lead response into a targeted engagement. Full Circle Matchmaker assigns leads to the right account owners using configurable rules to automatically route to the correct salesperson. Set auto-conversion rules to manage your leads and contacts in your CRM. With Full Circle Matchmaker, enable your teams to engage leads with the right messaging at the right stage to accelerate and close deals. Want to see how you’re doing with your accounts? Trying to pinpoint the neglected target accounts in your CRM? Full Circle Matchmaker gives you essential visibility on your account engagement through an account list view that shows your Account Activity Ratings. In one place, your sales and marketing teams can better understand and track the health of your company’s accounts. Full Circle Matchmaker is easily self-configurable through a simple UI. With a few drop-downs and drag-and-drops, customize the underlying logic through a built-in intelligent matching rules engine and intuitive assignment and conversion settings. Whether you prefer a more out-of-the-box setup or tweaking the rules to fit the workflows of your business, Full Circle Matchmaker was built to ensure that the matching, conversion, and routing fits your unique needs. As a native Salesforce application, Full Circle Matchmaker is easy to administer and implement, so you can get up-and-running and make an immediate impact on revenue! Finally, connect the dots between leads and accounts. Engage smarter. Measure completely. Request a product demo today. Download the Matchmaker Datasheet below for more information on this product.